The S/S 18 runways were clear about one thing: Shorts are set to trend. Almost every major design house showed their own iteration—from Saint Laurent’s sultry leather versions to Louis Vuitton’s silk running shorts and Isabel Marant’s utility styles. Yes, shorts are back and are being dubbed as power shorts. Blame it on Kim Kardashian West or an enthusiastic bunch of designers revisiting the summer essential. (After all, we did spot cycling styles at Saint Laurent worn under every short dress and skirt.) Bermuda shorts are also back in a big way, thanks to Off-White and Tibi. This is a no-holds-barred situation. 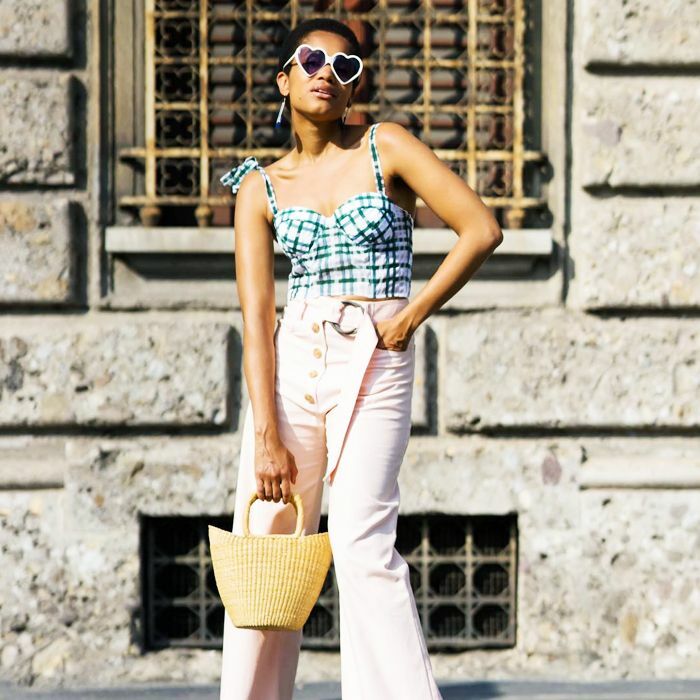 With a new season comes new style rules, and here at Who What Wear UK, we’re determined to give you all the info you’ll need in order to look chic in shorts—starting with what not to wear them with. Of course, you’re welcome to go wild and pair your cutoffs with whatever tickles your fancy, but if you’re looking for safe parameters, we’ve got you covered. 1. The key to ensuring that shorts have the ultimate leg-lengthening effect is to pair the shorts with shoes that finish no higher than your ankles (such as strappy heels). That being said, avoid wearing shorts with ankle boots. 2. When it comes to this trend, keep balance in mind. We’re not suggesting you only opt for a roll-neck, but itsy-bitsy crop tops aren’t always the most grown-up option to wear with shorts. 3. The key shorts silhouette of the season is on the looser side, so try wearing a slimline top that isn’t going to add unnecessary bulk. That means chunky knits, for the time being, are less favourable with shorts. 4. Ripped or excessively bleached T-shirts that are appropriate for the beach should be left at home. This goes for extremely distressed hot pants as well. 5. Shorts and tights are a no-go in all instances (sorry). Now that we’ve equipped you with the rules, it’s time to show you how we’ll be wearing shorts soon. Scroll down for some outfit inspiration incorporating the coolest shorts this season has to offer. Style Notes: White shorts aren’t the easiest of styles to wear, but Monikh Dale’s mixture of a snake-print top, raffia shoes and white shorts gives off a luxe feel. Keep your colour palette simple and finish the look with delicate gold jewellery. Style Notes: The short suit was a big hit on the runways, and we’ve spotted this Mango one on loads of influencers including Lucy Williams. It’s equally as sartorial as a trouser suit, but the shorts make it summer-friendly. This would also look great with a classic T-shirt and loafers. Style Notes: Classic denim cutoffs (especially slightly longer ones) will see you through a warm season. Instead of wearing them with prairie blouses, style the shorts with souped-up sportswear and minimalistic shoes. Style Notes: You may think cycling shorts have no place in your wardrobe, but they’re actually incredibly practical. For a forward look, try layering a pair under a risqué dress. Style Notes: A Man Repeller–inspired print mashup is the perfect way to make casual shorts contemporary. Opt for something in a silky fabric or pyjama-inspired, and don’t forget to add evening shoes. Style Notes: Pernille Teisbaek’s outfit is a lesson in how to style shorts the grown-up way. When worn with a longline blazer and white mules, denim shorts look smart and flattering. Ready to get your legs out now?